We first see the Patronus in J.K. Rowling's 'Harry Potter and the Prisoner of Azkaban'. It is magical, a trained wizard conjuring a mist-like shield to ward off the Dementors, dark entities that feed upon happiness. Except it really isn't magic, is it? Consider what Lupin tells Harry while explaining how to make his patronus. "With an incantation, which will work only if you are concentrating, with all your might, on a single, very happy memory." That incantation, of course, is Expecto Patronum. But there is so much more to it than those two words, isn't there? For me, this is such a wonderful allegory of something so simple yet so hard to master. And yet so many have missed the beauty of what the Patronus represents. Godyears, this blog, turns 12 at the end of this month. Statistically, the numbers sound good with the blog reaching over 14 lakh views. But the truth is rarely about numbers alone, is it? It has been a tough year both personally and professionally. There were a lot of unexpected twists that sprung up and painful decisions made. Reliving them brings me no joy. Most of the happy memories of the last year, the ones that got me through the year, were via the world that many still tell me (12 years after I joined) is a passing fancy, the blogosphere. The moments I truly cherished this year? 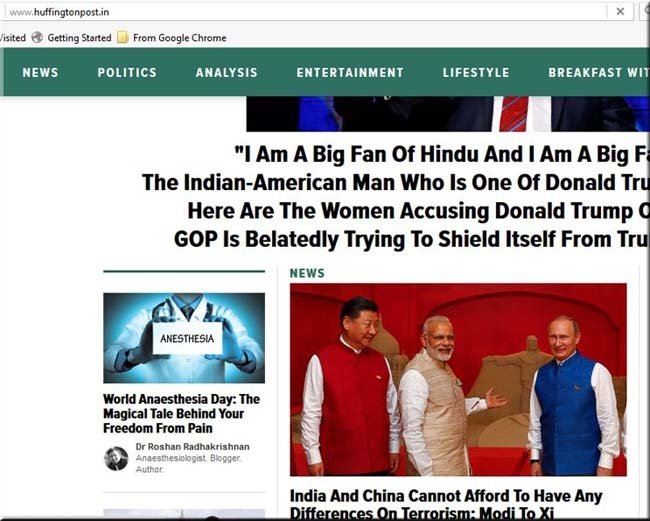 I finally got published in Huffington Post. It is a 'bucket list' moment to see your name lodged between a Prime Minister and a US Presidential candidate. More satisfyingly perhaps, I stuck to what I do best at the blog in my published articles as well - writing on multiple genres. 1) My first article was on Violence against Doctors in India and a multi-pronged solution to it. 2) Two weeks later, on Valentine's Day, I wrote on a love story you have all read about in the comics section of your newspaper without even realizing it. 3) My third article was on suicide prevention, a topic dear to me. 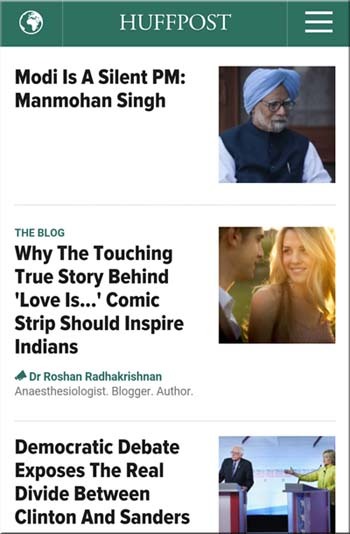 4) And my fourth and final topic (for now) was published on World Anaesthesia Day, celebrating my profession and was placed at the top of the Huffington Post page that day. 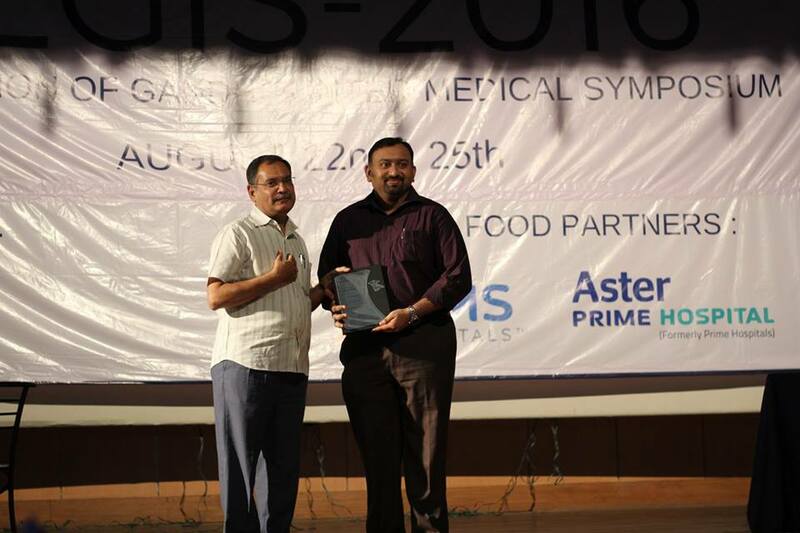 I was invited to be a panelist for a debate at AEGIS, a national medical conference in Hyderabad, a first for me. 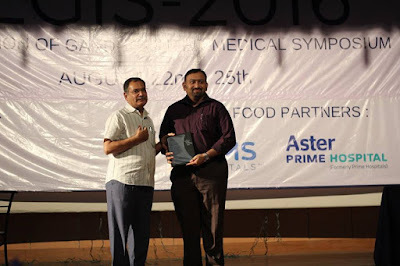 The topic dealt with the 'role of technology in teaching medicine for doctors in India'. who shapes the lives of thousands of Indian doctors every year. I would never have been considered for this as a doctor alone, sitting anonymously inside an operation theater. Being a blogger and someone who uses technology to reach out to a larger audience made the difference. 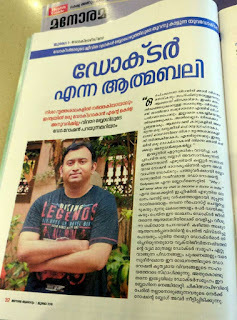 There was a three page article featuring me in this year's Doctors Day Special of the popular state health Magazine, Manorama Arogyam. 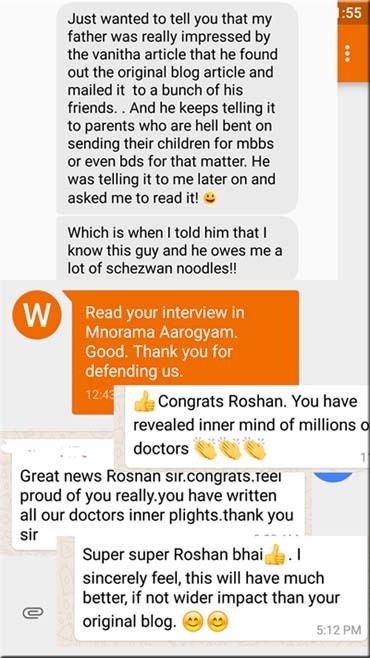 It was, of course, related to the viral post from last year where I ended up in the news for my detailed post explaining why I would never allow my child to be a doctor in India. For years, I have been fighting to get people to listen to the woes of the young Indian doctor and open their eyes to the dismal conditions we are forced to work in with terrible odds against them. Who would have thought reverse psychology would do the trick? 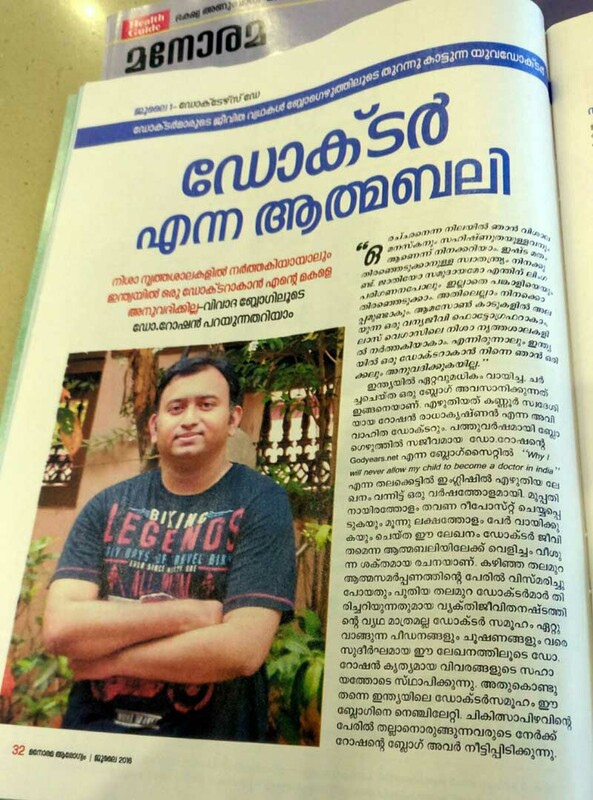 The article got me lots of positive comments from doctors in Kerala, happy that there was a voice defending them albeit in such an obtuse way. 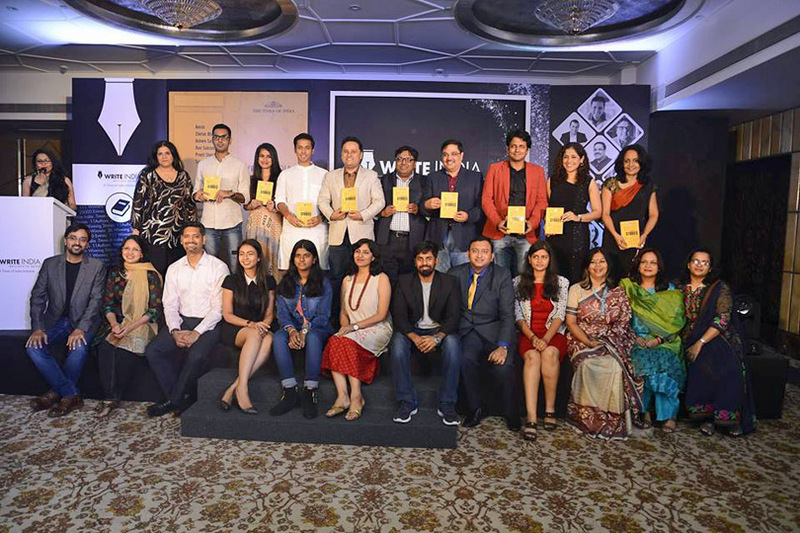 I recently spoke about winning Write India, India's largest literary competition ever, and what a wonderful book launch we had in Mumbai. It remains one of the best moments of my life. In my muddled acceptance speech, I did thank a thousand faceless people - everyone who had kept encouraging me in the blog over the last decade with their comments. Without their brickbats and bouquets, I would not have kept trying to do better with the next attempt at fiction... I would not have won. In real life, darkness often lies within us in the pain and sorrow of despair and depression. In J K Rowling's world of muggles, wizards and fantastic creatures, this darkness attains a foreboding but real physical form as the Dementors. And luckily for us, she shows us how to defeat them. Her concept of the Patronus is a shield we create by ourselves, warding off the darkness surrounding us by focusing on our happiest memories. Harry Potter thinks of his parents. Snape thinks of the woman he loved. The memory differs but the strength to ward off despair using a happy memory holds true for them both. And Rowling does showcase how difficult it is to manifest your Patronus, especially when confronted by a Dementor. Years ago, I had talked about the concept of making a list of your good memories and holding on to it to read during tough times. I do that even today, saving the supportive comments of readers and friends alike. And when I feel it is hard to continue, I return back to those comments I have saved separately. The common thread binding all the above cherished memories of mine this year are not my words...but the support and comments I got. And that's what I turned to this year when my Dementors came for me. My patronus, in the end, is words. Not my own but the kind words of others. My sincere advice to you - learn to identify and Conjure your patronus. Think carefully of the memories that make you happy. Save them, not just in your mind but also in an actual physical form, accessible to you instantly via online drives or your own laptop and mobile devices. They will remind you of how cherished and valuable you are when your dementors come and you cannot think straight. They will help you get through the darkness and back into the light. For me, bringing a smile on a person’s face and making them forget their own worries is the ultimate reward at the end of the day. Professionally, I achieve this by donning a mask every day and working as an anaesthesiologist to relieve physical pain and suffering. On a personal level, I do the same with my words, replacing the mask of an anaesthesiologist with that of a whimsical writer. My name is Dr Roshan Radhakrishnan and welcome to my Godyears. That is a very long blog Rashan and I'm afraid I didn't read all of it. It seems you have had a wonderful lot of recognition this year, if nothing else. Thank you for dropping by my blog. Happy 12 year blogosphere. Here is one more good memory for you to store away, perhaps: I enjoy your writing a lot. Here's to many more years of reading your blog. Touchwood, there will be many more years. You are always capable of bringing about change... just do the right thing. In a world as twisted as the one we live in right now, that itself takes courage. Conjuring up your patronus from happy memories is a wonderful skill to have. A very eventful year indeed .Enjoyed reading . Thank you very much for writing g with us on #ThankfulThursdays. Congratulations on completing 12 years blogging. That's an inspiring landmark. Thanks Amrita.. the timing coincided well with the blog's anniversary so when you mentioned about ThankfulThursdays, I knew I should write for it. 12 years - that is a great milestone, doc!! Many Congratulations to you and I'd like you to know that I'm also one of the many that have been inspired by your words. Here's wishing you a great future for the blog and for yourself. Gosh how beautifully you related Hp and your words... and you made me really emotional at that snape's patronus point... congratulations on your achievements... you deserve all the love and appreciation... you have moved people with your words... and that's a super power you can wield so well. Note... I am still laughing at that comment on my blog. I thought the concept of the patronus was quite easy to grasp so I was surprised while talking to many that they had not thought of it at all. This seemed like a good time to get the point across. And I stand by what I said at your blog... stand upright, unlike you!!! I absolutely loved this post Roshan and I am glad you wrote about the strength of the Patronus charm. I think it’s a brilliant mantra given by Rowling, something like the essence of Rhonda Bryne's The Secret but way, way better! 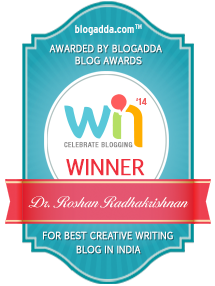 Twelve years of blogging....woohoo, hats off, congrats, take a bow man! You've made a huge impact with your amazing writing, be it fun movie tidbits, reviews, thought-provoking stories or socially relevant issues, you've written from the heart and that is bound to reach out to people. I strongly believe in the magic of words, like Dumbledore puts it,'Words are, in my not-so-humble opinion, our most inexhaustible source of magic. Capable of both inflicting injury, and remedying it.' You have indeed worked magic with your words doc! May the Patronus you've cast dispel the vilest Dementors away! I'll keep in mind about physically saving kind words as reminders to help me with my Dementors! Thanks Kala. And yes, the concept of the Patronus as well the essence of Rhonda Bryne's Secret are two key philosophies I follow in my personal life. And they have gotten me through some very tough times. Trust me on saving kind or encouraging comments. It really does make a difference. Even if it years later and the friendship has waned, you will still have the kindness of the moment with you instead of the sorrow of loss. Congrats Roshan on all your achievements and may you have many more. Enjoyed your analogy with HP. Prisoner of Azkaban was my favourite book so loved your post even more because of that. For me, Prisoner of Azkaban (both as a book and movie) was where the franchise changed from a possibly kid-oriented series into a very mature and deep one that resonated with adults too. Congrats Roshan for everything you have achieved apart from your daily work, which I must say would be very taxing. I am so happy to be in your sphere and would love to meet you. (Missed the golden chance during Write India workshop in Mumbai) And you are right about the 'patronus' philosophy, I have personally experienced that. God bless! True, as a writer, there were some proud moments. And that has kept me going through tough times. Wow! Congrats on all your achievements and you deserve all this. Also, when ever you feel low, remember how many people you inspire. So, keep at it. Life throws a curve ball and all we should do it is catch it and then pass it on. Keep writing! God bless. Many a curve ball indeed has been thrown my way this year... for now, just letting it all go. Perhaps next year, there will be a new approach. First of all congratulations on such a wonderful milestone -12 Yrs!!!!! I hope you are feeling on top of the world & yes its well deserved for this post is simply brilliant. I loved the way your have allegorised Expecto Patronum to drive home the basic truth - Count Your Blessings!!! Thank you for writing something so meaningful; it has connected with me a lot. Many Cheers & congrats on all of your other accomplishments - maybe your patronus shine brighter day by day!!! The inner meaning of expecto partonum hit me the first time I read that book. Was honestly a little surprised when many found it a novel connection. Congratulations Roshan! completely awed by your achievements and blogging, that too with your full time job. Truly inspirational Roshan, happy to be here and reading this. I never knew that reading about another person's achievements would make me so happy. Being a doctor myself, I have been told many a times that it is indeed rare to see a doctor chasing her passions, when her life would already be drowned deep in studies. Somehow or the other, my thoughts go back to what you have been doing, balancing it all so well, over the years. Kudos to you :) Happy 12th Anniversary too! Many people even within our medical community say that to others, demanding we give up our other pursuits because 'that is the way it was'. I've always said the opposite - make time for your passion. Don't allow work to get in the way of being who you wanted to be. 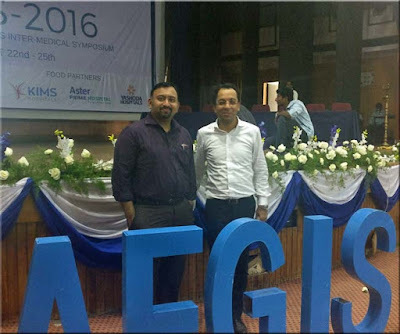 Roshan, my eyes welled up when I read the last para of your post. The happy memories that tell me I am valuable to someone...I so need these, considering the sense of worthlessness that consumes me day in day out. I have decided that my next post is going to be on this very topic. Thank you for that! After all that I read that you have achieved, I feel proud to know that I have actually met you in person! I have met this amazing, strong, brave and sensitive man in person! You know how that makes me feel? It's that 'collar tight' moment, if you know what I mean! 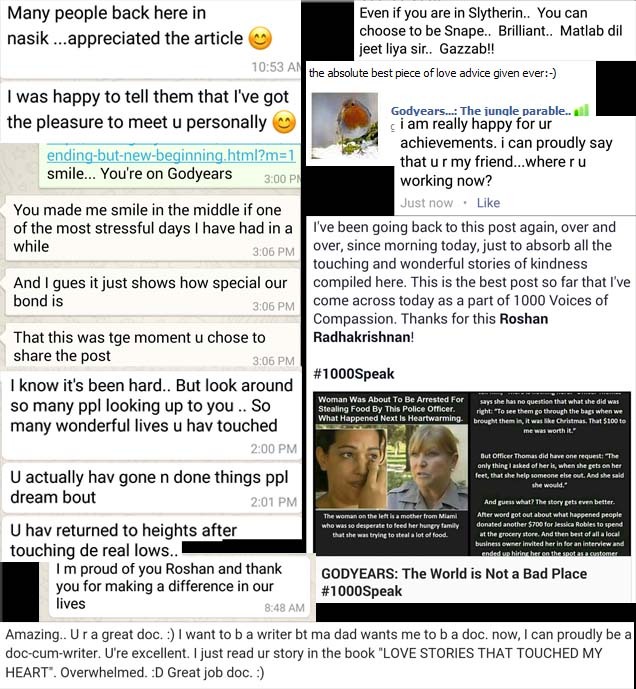 :) You may have seen lots of downs Roshan, but despite that you kept going, and achieved all those 'ups' ..that is what makes your story an awesome read , and you an awesome person. 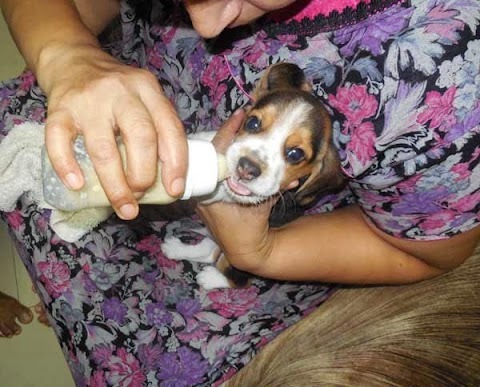 God bless you, my dear! May you achieve all that you wish for and may you get all the love you so deserve! There are still many a 'down' in my life. I just prefer not to show it directly at least for now. That comes with its own pros and cons but then, if we can make others smile even for a little while, should we not try to do it? Kudos, doc. So proud of your achievements. Despite your hectic schedule and troubles, you try to spread cheer. Here's wishing you many more successes and decades for the blog. Thanks Rachna... yes, the schedule forces many a compromise and I don't know how it will be in the future but for now, this is good enough. Wow Roshan. It's a beautiful concept you explained with the Patronus. I will follow it when my blog numbers go down and no one really cares whether I write or no, I will go back and find the beginning. Happy Anniversary and going so strong. It works for me anyway! Twelve years is an achievement indeed. Kudos to you and hoping to read more from you in the future days you come. I can relate with you sir on so many grounds, and that's why from initial days I am following you and can able to visualise the things clearly for me that was just in my mind as a wish, only because if you have done it then I can also do it. I do believe in the power of good feelings because I do follow it in my day to day life. Wow!! Congratulations on the stupendous milestone achieved! your blog really inspires me one post a day �� just wishing that I'd chanced upon it sooner.. And your interpretation of the patronus charm is really cool although I kinda interpreted a patronus as a burst of positive energy that dissipates the darkness around you...A case of Potato vs potato, I guess?! A thoroughly enjoyable read! Thanks :D Keep dropping by. Thanks Jaish :) And I hope you have a lovely 2017 too. What an incredible year you've had Roshan! I don't know what it was that caused you heartache but all the moments of joy you've captured you should be really proud of ! Being published in coveted platforms , writing posts that are close to your heart and tough many hearts .. What a blessing it is. And to get all the love and adulation .. Am just so proud to know you ! Have a fantastic 2017 .. And keep shining ! So what do you think ? 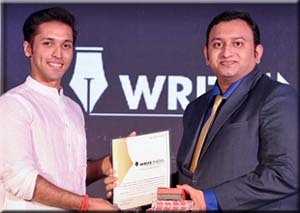 Winner of the 'Best Creative Writing Blog in India' at WIN'14, the Country's first Live Blogging Conference & Awards Ceremony. Over 5 lakh page views for the blogpost heard around the world - "Why I will never allow my child to become a doctor in India"
100+ articles. 200+ positive moments. My series chronicling real-life heroes of kindness and compassion from across the world who will restore your faith in humanity. 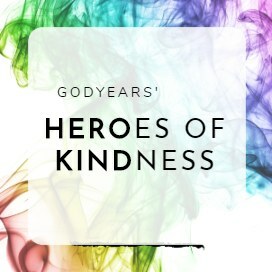 Godyears on Facebook, Twitter, Pinterest, Instagram, BlogLovin, Indiblogger or my RSS feed. You can also subscribe to my author profiles on Goodreads & Huffington Post.